Prima was so fun with my friend Karen, we were so tired as our brains filled up with new techniques and fast paced instruction. We were given so many things to keep us crafting and gifts to bring home. Prima really put together a perfect 2 day class for us ladies. Of course we shopped in their store for more products as well as meeting a few wonderful ladies. This is a event that was worth the money to go to. 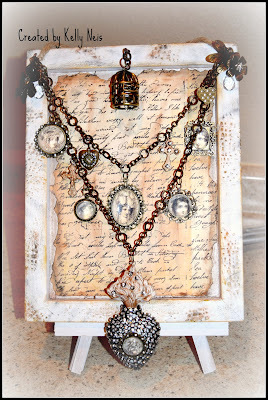 Their products are becoming so versatile and I want to show you some of my finished projects that we made in Prima. 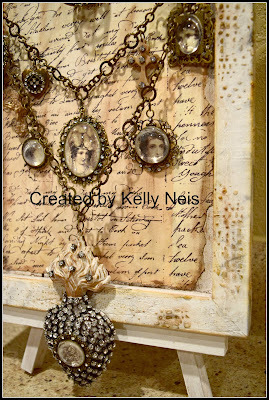 Using a wooden plaque and easel from Prima, we put some paper in the background and attached a necklace we made on it. 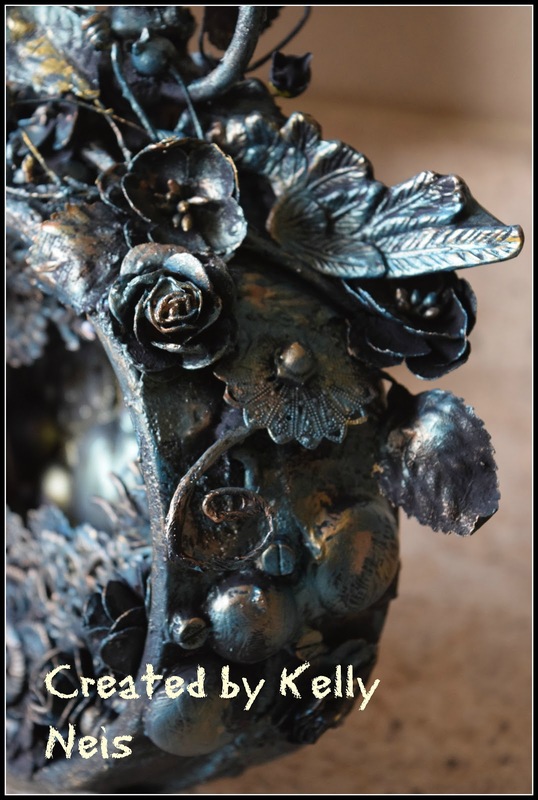 This project was given by Sandra Evertson who gave us a bit of history of the relics she has casted throughout her travels. She is full of energy and always smiling. We used paper to cut out faces and make the cameos from that, the heart is a relic from Sandra Everton that we glued a strand of crystals onto and a cameo we made. All this metal, paper, frame is Prima. 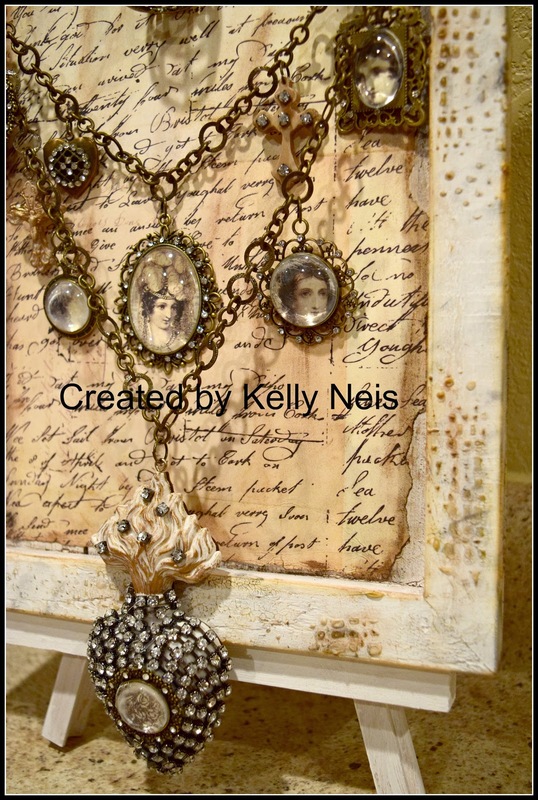 I added the texture around the frame with Prima mask and moulding paste, then I used their new mica powders to color it lightly. Finnabair, Anna was amazing, we had to work part of our lunch hour to finish our clocks, this was so fun we will be black gessoing everything. 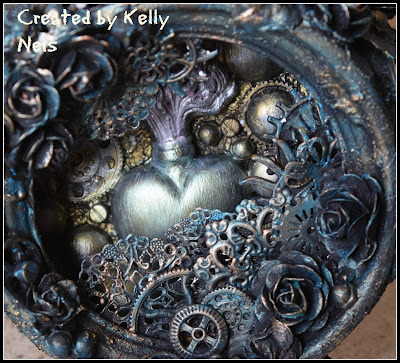 We glued on gears, flowers, metals, malange, and made the background with a new texture paste. We had fun! Anna Dabrowska is a very creative and talented teacher. I understood everything she said and what a beautiful young lady she is. 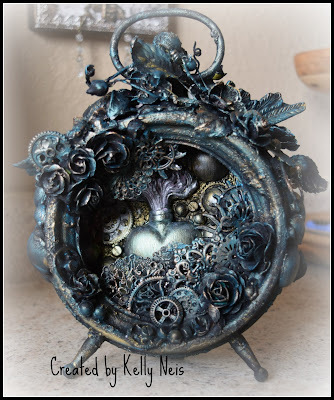 The relic is painted with the new Finnabair paint and glued to the back of the clock with other things. After gluing we gessoed it all in black then lightly dry brushed the new metallic paints on it. Amazing colors that popped out. You can see ordinary flowers here that we gesso in black and then lightly paint, the textures are amazing. 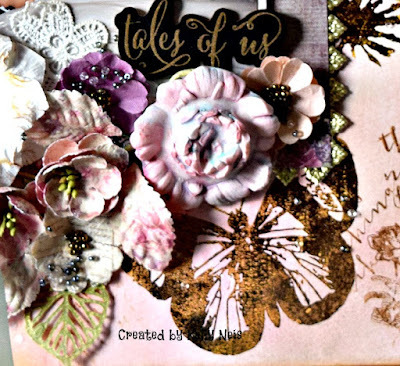 Sharon Laakkonen used a new Prima water color canvas with their water color crayons and foils to make this gorgeous scrap page, (canvas). We used flower relics and sprayed them with Prima Bloom spray and added all kinds of florals and die cut leaves to achieve the corners. The background is all water colored then lightly stamped, a mask with birds for texture and the matted photo. Here you can see the relic with some of the foil along the edges. This is a beautiful piece and they have a lot of different sizes of water color canvases. I have to say that Sharon is like the nice neighbor next door, sweet, nice, positive and funny. She was so inspiring and fun to follow along with. I am missing 2 more pieces, the plaque from John C. Petersen I needed to glue again, the plane took its toll on it. John is awesome, he is so nice and helpful for us, I loved his sense of humor. John is so fun to have around. The book from Frank Garcia that we made never got finished so I will have to make all the pages inside and embellish them before I show you. Frank is as he is on the Prima Ustream. 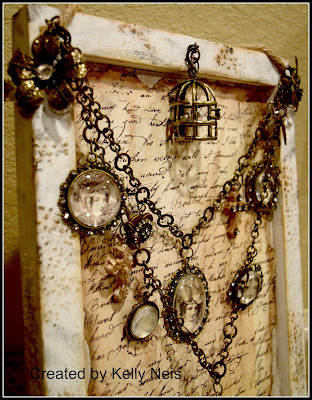 He invents the papers and embellishments which are all so awesome. The best coordinator of all this was Denny Dupree, his hair is so cool and he is hip! lol Very calm, full of energy and made sure this all worked for us ladies. He did a amazing job, worked hard for us and I want to thank him and all the instructors and helpers we had to give us this amazing experience. Karen got me hooked on Starbucks and a Croissant every morning and was so easy to live with for the week. I am so blessed, truly to have her in my life!!! I find it rare to find a friend that compliments me and whom I can live with, haha I had such a great time, thanks for putting up with me Karen!! I hope you were inspired by the creations I made and they are having another event in April with a gorgeous ocean view here is their Facebook page. Big hugs and THANK YOU so much for sharing your outstanding projects that just floored me.